The TA9 ... increased fuel efficiency. Featuring 55 kW (74 hp) JCB EcoMax turbo-charged diesel engines, the new TA9 and TA10 models will offer users increased fuel efficiency without any exhaust after-treatment requirements, according to a spokesman for the UK-based firm. “The first-to-market units emit the lowest carbon dioxide (CO2) figures for comparable payloads on the market today, as well as delivering a lower cost of operation and efficient cycle times,” he claims. 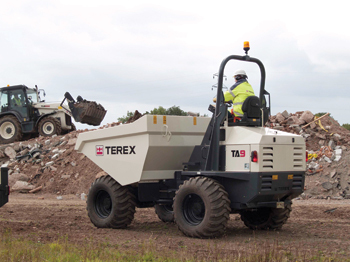 He says in order to ensure that site equipment meets the latest international regulations – in particular essential emissions control, Terex made the decision to move away from its current engine solution and instead look towards the 55-kW EcoMax alternative. “Each new TA9 and TA10 site dumper is fitted with the enhanced engine set-up – delivering a compliant on-site solution capable of meeting the highest international emissions regulations,” he adds. The new Terex dumpers feature an innovative liquid crystal display (LCD) dashboard, complete with hour meter, coolant temperature gauge and fuel level readout. Early warning alerts help to prevent costly downtime and enhance operator safety. In addition, a user readout panel provides real-time machine information, while Engine Control Unit (ECU) technology manages performance data to improve reliability. The launch of Terex’s Stage IIIB/Tier 4 Final-compliant range of nine- and 10-tonne site dumpers completes the transition of the brand’s portfolio (TA6, TA6S, TA9 and TA10) of site dumpers to JCB as the new exclusive engine supplier. Terex says it will maintain a price freeze on the TA9 and TA10 models throughout 2015.